A car dealership in Burton is set for an historic move as it vacates its old premises in the town centre for a new, purpose-built site outside the town. TL Darby is currently based in Brigade House, New Street. The site was opened as a fire station in 1903 before it became a new and used car dealership in 1974 – on one side of the road it has offices and a showroom, and on the opposite side of New Street there is an outdoor showroom space. 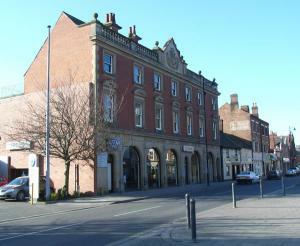 However, the company has now made the decision to relocate to a larger, more practical space outside Burton. Location is, needless to say, a critical factor when choosing a site for a car dealership; not only does a business need to ensure it has enough space and is easy enough to access for customers, but location could also play an important role in determining the price of a motor trade insurance quote, with statistics for things like crime and flood risk being taken into consideration. According to the Burton Mail, TL Darby will be moving location at the end of 2014 and work is well underway at the new state-of-the-art showroom. The new site in Wellington Road, Centrum 100, will allow the company to display a wider array of vehicles, as well as having easy access to the A38. The current town centre-based dealership has been a stalwart of the Burton high street and has enjoyed great success in its time there. Working out of the historic site, the acclaimed family-run business was named Volkswagen's top large retailer in 2012, 2009 and 2008.